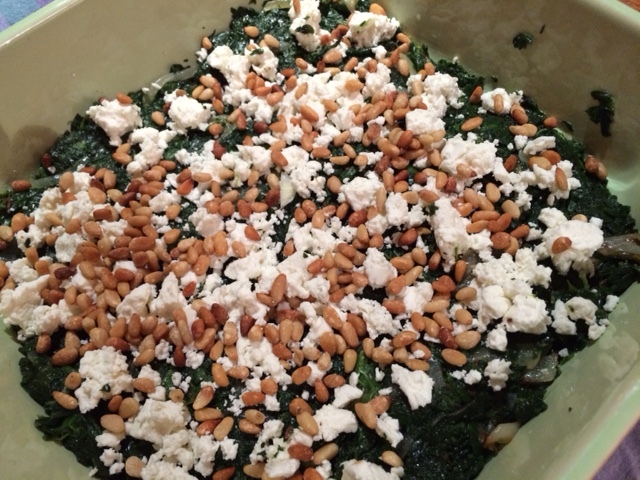 Posted on 28 December 2014, in Cottage Cooking Club and tagged Cottage Cooking Club, Greek, spinach. Bookmark the permalink. 9 Comments. Hi Betsy! Loved your choices for the month and I just know the spanakopita will be the hit of the month, a dish I did not get around to. The risotto looks good. Wishing you a very Happy New Year 2015! Bon Appetit and Cheers! You are the second CCC colleague who has made the risotto. I wasn’t tempted by that until I read your two write-ups. I am happy you liked the Spanakopita and am very impressed you made the puff yourself. I used caraway seeds and feta so I suppose it tasted differently for the 3 of us (you, me and Howard). Betsy, I really enjoy this cookbook and plan do be a bit more ambitious this winter when I have more leisure time and a better stove and kitchen. FYI, Diane B. just found out, when checking this morning, that they lost their bees. I hate that happening to her also. The second year in a row. It’s a tough “hobby”, isn’t it. Happy New Year to you and Howard. Love working and cooking and knowing you. 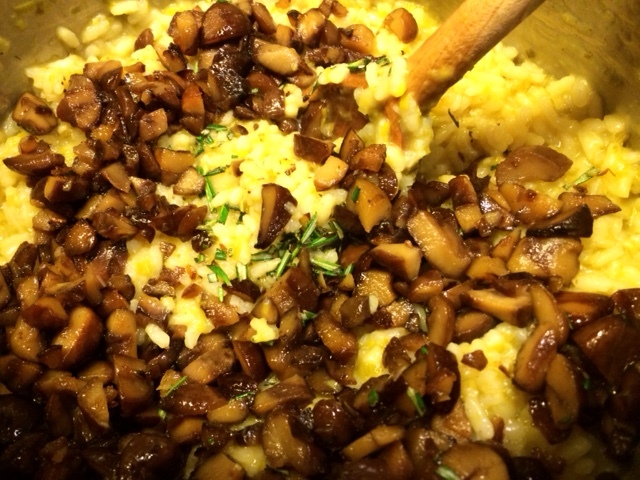 Ooooh….truffle salt on the risotto sounds like a fabulous addition. My family complained that it was too sweet but some Parmesan cheese fixed that. 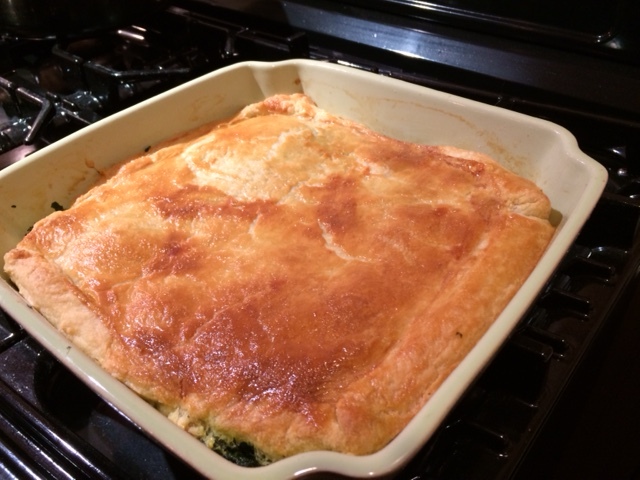 Your spanakopita looks beautiful as a pie, and with homemade puff pastry no less. I think this recipe may be the universal favourite this month. Looking forward to cooking with you in 2015. Have a wonderful New Year! Hi Betsy, oh the leek and chestnut risotto looks amazing, good idea to add the truffle salt. Wish I would have prepared that one as well. My favorite was the spanakopita, love the flavor. Happy New Years! Dear Betsy, you made two wonderful recipes – we enjoyed both of them. I had never heard of a squash stock before – but I am quite intrigued now. And truffle salt sounds like a fabulous foodie item to own as well – glad that you enjoyed the Spanakopita as much as we did – I am quite impressed with your homemade puff pastry, I never bother but I know that I should, because it probably tastes much more delicious than the store-bought one. Thank you very much for being part of this online cooking group – I appreciate all your kind comments and your support! Wishing you, Howard and your family a Happy and Healthy start to the New Year – looking forward to another year of cooking adventures! Liebe Grüsse, Andrea & Co. I made the risotto as well, and I have to admit to a dash of truffle salt myself! :) I thought it was pretty good, though I am not generally a fan of risotto, and never make it, so I wanted to give it a try. Did not get to making the other recipes I was “supposed” to. Your spanakopita looks delicious! I am reminded that I really want to try your pastry. It always looks so wonderful, and you keep telling us (me!) how easy it is. I’m happy that you enjoyed it! Squash stock? Intriguing! Love the sound of it. 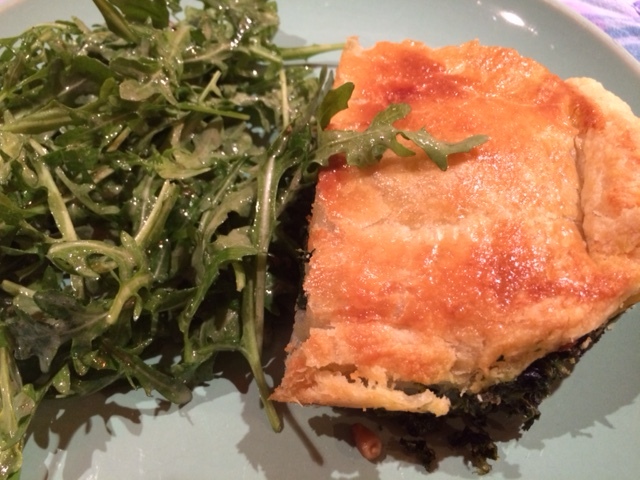 The spanakopita seems to be a hit this month – I’ll have to give it a try. I wanted to make the risotto, but didn’t have time to fit it in. Reading the descriptions from those who made it is making me want to get to it soon! The spanakopita looks wonderful, too. Glad to hear it’s going into your regular repertoire. Lovely! I want to get back into CCC, hopefully once life calms down we will back on track.